Preservation Framing: Our Commitment to you. At The Framer’s Workshop, we use the most up-to-date archival preservation methods and materials for the longevity of your artwork. Our philsophy is simple, we not create an aestheticly pleasing design that will accent your artwork and work with your decor, we preserve your framed art in as close to the original condition as possible. To do this, we stay current with accepted preservation practices through continuing education, and we constantly hone our skills to offer you the best possible protection for your valuable art. All framing projects receive the benefit of our three decades of experience. Preservation Framing, in the purest sense, is the use of framing methods and materials approved by the US Library of Congress for custom picture framing. Many framers use the term Preservation Framing interchangeably with Archival or Conservation framing. The picture framing industry and the Library of Congress now use the term Preservation Framing, which more accurately describes what we do. Preservation framing serves the purpose of preserving and protecting artwork in as close to original condition as possible for a long period of time. For more detail, please refer to The U.S. Library of Congress Guide to Preservation Matting & Framing. 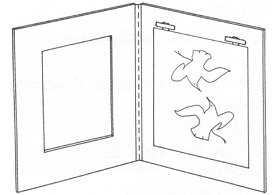 The Image Permanence Institute also publishes excellent guides to preservation framing. For further information on our framing practices, we present various Framing Spotlight articles taken from our previous monthly newsletters. (Subscribe to our newsletter with monthly discount coupons!) Here you will discover the best choices for matting, mounting, and glazing to help your treasured artwork stand the test of time. Watch this page for future Framing Spotlight articles. The main purpose of matting is not just visual, but protective. Mats keep the glass from coming into contact with your artwork. This provides an air space to prevent damage due to condensation behind the glass. For other design options, we use liners, mat walls and acrylic spacers to separate artwork from glass and acrylic. Fine art must be secured in a way that will accommodate changes in the art itself. In most cases, we hinge art on paper from the top so that the art will not buckle as it expands and contracts. Hinges should be reversible and should not alter the art substantially. At The Framer’s Workshop, we suit the type of hinging material to the requirements of the art. Fabrics, for instance, are usually sewn in place. Three-dimensional objects require varying types of attachments. Non-adhesive attachments, such as polypropylene film corners may be used to support documents, magazines, and valuable art on paper. In all cases, we strive for invisible and reversible methods, and we discuss all the options with you. We also mount inexpensive posters to foam core board using a vacuum/heat press. The main benefit of this treatment is to prevent waving of the poster behind the glass or Plex, but the drawback to this method is that is not reversible. Large format photos are sometimes vacuum mounted, but very high gloss photo papers may not respond well to this treatment because of the chance of an "orange peel" textured result. We minimize this effect by using Kool Tack adhesive boards with a Perma-Lon ultra smooth release board. Our experienced designers will explain all the ins and outs of artwork mounting when you bring us your framing or mounting project. Ultraviolet light is present in nearly all forms of light, including sunlight, incandescent light, fluorescent light, and halogen light. UV light exposure causes artwork to fade, yellow, and become brittle. Although UV protective products will slow such deterioration, it is still important to hang valuable art away from direct sources of ultraviolet light. Moreover, ultraviolet light is not the only source of fading. Conditions such as heat, pollution and humidity will affect the possible discoloration and fading of artwork. Artwork may also be discolored and damaged by the use of poor quality framing materials. At The Framer’s Workshop we carry a variety of U.V. protective glass and acrylic in both clear and non-glare options. For budget picture framing needs, we also feature similar products without UV protection. 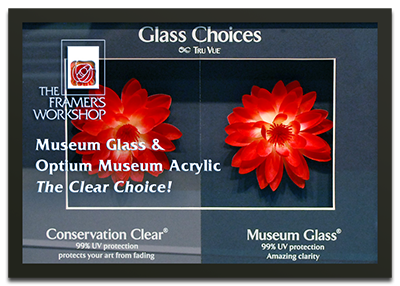 Museum Glass and Optium Museum Acrylic are our premium glazing options. The linked web page describes them in detail. Tru-Vue Conservation Clear Glass (U.V. Glass) filters 98% of damaging ultraviolet light. This is the glass you see on most of the art in our gallery and is our number one selling glass. Tru Vue Conservation Reflection Control Glass (Non-glare U.V. Glass) has the same U.V. filtering quality as clear glass, but has an etched surface to reduce glare. This surface softens the image with a resulting slight loss in clarity and color intensity. Tru-Vue Conservation Clear Acrylite (U.V. Acrylic) filters 99% of damaging ultraviolet light and provides an extremely clear view of the image without the slight greenish tint that is inherent in regular glass. Like other acrylic products, it is ideal for shipping and installing oversize pieces of art. Conservation Reflection Control (Non-Glare U.V. Acrylic) filters 99% of ultraviolet light and has an etched surface that is slightly less distorting than its glass equivalent. We use this product in many corporate installations where large windows produce glare, and we need an affordable acrylic product to reduce reflection. Tru-Vue AR Conservation Clear (Abrasion Resistant U.V. Acrylic) is similar to U.V. Acrylic with the addition of a scratch resistant surface. This product is ideal for office installations where janitorial services may be cleaning the framed artwork. Tru-Vue Premium Clear Glass is a quality clear picture framing glass for budget projects that do not require U.V. protection. Tru-Vue Premium Clear (Clear Acrylic) is a general purpose, defect-free acrylic for picture framing without UV protection. UltraVue® glass offers the same superior anti-reflective properties you've come to expect from Tru Vue, on a water white substrate. This high-quality, anti-reflective glass product provides 65% UV protection and is optically coated to create a nearly invisible finish. Similar to its other anti-reflective products, Tru Vue uses its proprietary coating process using Magnetron Sputtering technology, which deposits precisely controlled layers of highly energized metal oxides onto a 2mm, water white substrate, to produce the UltraVue product..